Cowon Global makes a wide range of portable media players. There are 4 video profiles for Cowon devices: MPEG 4 Video for A3, O2PMP and O2 and AVI for A2, Q5W and S9, Cowon WMV and AVI for D2+. 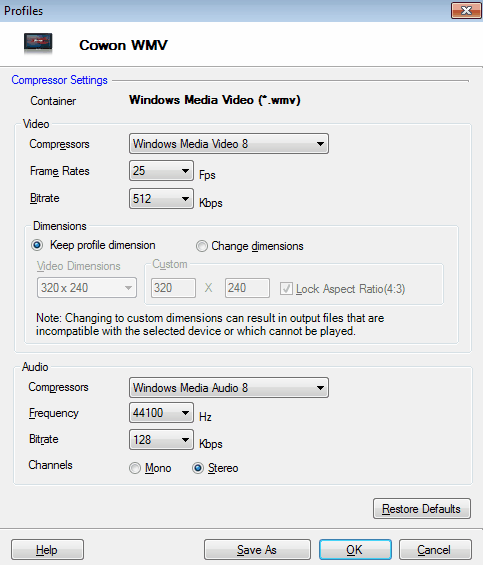 By default, the video file format is Windows Media Audio (*.wmv) and the compressor is Windows Media 8. You can change the compressor to Windows Media 7. The frame rate and bitrate are set at 25 Fps and 512 Kbps respectively. The video dimensions can be retained or changed according to the device specifications. By default, the audio compressor is Windows Media 8. The frequency is set at 44100 Hz, bitrate at 128 Kbps and audio channel on Stereo. All the settings can be changed except for the video file format. The audio file format and compressor is MP3 (MPEG 1 Layer 3). The frequency is set at 44100 Hz, bitrate at 128 Kbps and audio channel on Stereo. The frequency, bitrate and audio channel can be changed for this device profile.